Within the last 30 years, the 2,000-mile border between the United States and Mexico has become what the American Medical Association calls, "a virtual cesspool and breeding ground for infectious disease (Public Citizen, 2000). "� The causes of this unfortunate observation are the more than 3,000 manufacturing plants that cover the Mexican border known as the �maquiladoras.�� The maquiladoras are the mostly American-owned factories along the Mexican border that assemble products for export to U.S. markets (Nation�s Health, 1998). The Mexican maquiladora program, implemented in 1965, created a free trade agreement for foreign companies to bring materials into the country for manufacturing.� The goal of the program was to provide Mexico�s northern cities with a better job market while also providing foreign manufacturers with cheap labor.� The maquiladoras do provide Mexican border cities with a great number of jobs, but at the expense of low wages, terrible working conditions, low job security, and high exposure to toxic chemicals (EHC, 1998). Unfortunately, NAFTA did not have the effect that its proponents had talked of.� In 1995, two years after NAFTA was implemented, the maquiladora work force increased by 20%.� The agreement also did little to help disperse the plants further from the border areas.� In 1995, 85% of all maquiladora workers were employed in one of the six Mexican Border States (Public Citizen, 2000).� Another downfall of NAFTA was the disposal of toxic waste from the foreign-owned factories.� Under the original maquiladora program, foreign manufactures were required to return all waste to the country of origin, however NAFTA allows all goods imported to the maquiladoras to remain in Mexico, including the waste products (EHC, 2000). � 53% of the workers interviewed claimed not to have received any written information from their employers that explained the hazards of some of the materials used on the job. � 40% never received any training sponsored by their employer that went over hazards and different safety precautions. � 40% of the maquiladoras represented in the survey did not have a joint management-worker health and safety commission.� Such a program is required my Mexican law (Nation�s Health, 98). Hazardous conditions within the maquiladoras are just the beginning of the problem.� The presence of the maquiladoras combined with loosely enforced Mexican environmental laws and a lack of suitable waste storage and treatment facilities, cause the border area to be among the most polluted in Mexico.� Even in the event that one of the factories is shut down for environmental reasons, that does not necessarily mean an end to the factory�s pollution to the surrounding community.� Metales y Derivados, a lead-smelting facility in Tijuana, was shut down in 1994 when its owners failed to comply with toxic waste disposal laws.� However, the waste was never properly treated and/or relocated and is currently leaking through its containers, seeping into the ground, and contaminating community�s water supply (Global Exchange, 2000). �The Maquiladoras� Effects on the U.S. Although there have been environmental problems in Mexico since the implementation of the maquiladora plan, industrial damage is becoming more apparent on the United States border.�� Water and air pollution generated in Mexican border cities travels freely into the United States.� In cities such as San Diego, CA and El Paso, TX, the air exceeds U.S. ambient air quality standards and ozone levels are extremely high (Public Citizen, 1998b). Birth defects are a problem on both sides of the border.� A study conducted in 1994 was the first to show that maquiladora workers gave birth to lower weight babies than women who worked in other industries (Eskenazi, 1994).� Since then, studies have progressed to charting remarkable trends in birth defects. A study by the Texas Department of Health from 1993 �1996 showed that 15 out of every 10,000 babies born in the four Texas border counties were anencephalic, which is more than double the national rate.� During that same time period, 46 anencephalic births were reported in Cameron County alone, as well as 42 cases directly across the border in Matamoros, Mexico (Knight, 1998).� This trend still continues and in 1998, the Texas Department of Health has declared the entire border area continues to be a �high-risk area [for neural tube defects] compared to the rest of the US." (Public Citizen, 1998b). �Large Foreign Corporations: Take advantage of cheap labor and less strict environmental laws along the Mexican border by sending raw materials to Mexico to be assembled in the maquiladoras.� Corporations that are represented along the Mexican border include Ford, GM, Honda, Mattel, Sony, IBM, Fischer Price, and Xerox (Corporate Watch, 1999). 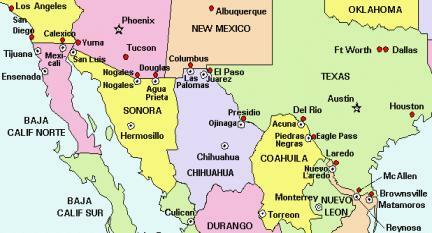 Mainly low-income, working-class families inhabit the Mexican borderlands.� The problem lies in the fact that most Mexican maquiladora workers barely earn enough wages to sustain themselves and their families.� Although factory workers in both the U.S. and Mexico perform comparable work, the minimum wage in Mexico is only $3.40 per day compared to $5.75 per hour in the U.S.(Public Citizen, 1998a).� Almost all of the workers� weekly wages are spent on necessities making it nearly impossible for them to save money and improve their situation.� In 1998, the Mexican government raised minimum wage by 14%, however the consumer price index rose 18.6% that same year (Corporate Watch, 1999). With so many people in border towns who are affected by the maquiladoras, there has to be a method of organizing groups into a more powerful force in order to bring about a more efficient campaign.� One of these groups is Comit� Ciudadano Pro Restauraci�n del Ca��n del Padre, A.C.� Since its start in 1980, the group has successfully rallied 23 communities together in the struggle against the maquiladoras.� Through community outreach and organization, the Comit� Ciudadano Pro Restauraci�n del Ca��n del Padre, A.C. has helped to close down Metales y Derivados and Alco Pacifico, two large lead smelters, because they were not in compliance with Mexican environmental laws and therefore a public hazard (EHC, 2000). An indirect way to help the border situation is to simply not buy products produced by maquiladora-owning companies.� Global exchange, along with other non-profit organizations, owns several fair trade stores where consumers can be assured that they are not contributing to the horrible working conditions of the maquiladoras.� Many fair trade stores guarantee equal opportunities, gender equality, no child labor, and 15-30% of the retail price to their artisans, who would ordinarily earn a very small portion of the profits (Global Exchange, 2000b). For this case study, I will focus on the opinions and recommendations from three different groups and/or people that are involved with the border campaign: the Environmental Health Coalition (EHC), PFEA, and Lori Salda�a, a former chairwoman of the City of San Diego's Wetlands Advisory Board. As mentioned previously, the EHC conducts extensive work with border issues through their Border Environmental Justice Campaign (BEJC).� BEJC has four main points of recommendation to help improve the border situation. � Right-to-Know: Promote workers� rights to know what chemicals and hazards they are exposed to in the workplace. � Amend NAFTA: Currently NAFTA�s regulations for protecting maquiladora workers and the environment are weak and not often enforced.� The agreement needs to be amended to help provide for the health and safety of the workers. � Right to Participate: Many workers refuse to speak out against working conditions for fear of losing �their job and being blacklisted from other factories.� Every citizen should be guaranteed the right to participate in the implementation of projects that can affect their quality of life.� BEJC calls for government and industry to require public participation in big decisions that affect everyone. Lori Salda�a is still involved in wetland conservation in San Diego, CA and has been the plaintiff in a lawsuit regarding the construction of a wastewater treatment plant in the Tijuana River Valley.� Her recommendations are very similar to those of the EHC and include a greater enforcement of Mexican environmental laws, encouraging maquiladora owners to better invest in the infrastructure of northern Mexico, and also developing funding programs to improve conditions along the border (Salda�a, 96). Knight, Danielle.� (1998, June 18).� HEALTH: Birth Defects Continue in US-Mexico Maquiladora workers report unhealthful working conditions. ���������� (1998).� Nation�s Health.� Vol 28/Issue 1. Sawicki, Steve.� (1998, Jul/Aug).� The maquiladoras: Back door pollution.� Norwalk: the environmental magazine.� Volume 9/ Issue 4.